PS suppliers in Europe returned to the market with three digit hike requests for March citing tight supplies region wide and rising upstream costs as per ChemOrbis pricing service. Prior to the styrene contracts that settled up €175/ton, expectations had centered on hikes of up to €80/ton. However, sellers’ current hike requests are surpassing the monomer increase since they are asking for €190-200/ton hikes to recoup their margins. A distributor in France reported, “Our suppliers aim for €200/ton increases for West European PS cargos given short supply for March. The market may continue to rise in April as well.” A seller in Germany also blamed higher feedstock costs and tight supply in the region as the reasons behind their hikes. A seller in Italy stated that his supplier was planning to shut their plant for a maintenance that might last for 4-5 weeks. Buyers confirm short PS availability for the second month in a row. In February, some buyers were not able to build stocks as their regular suppliers provided limited volumes. However, they still hope that sellers may trim their initial hefty hike amounts depending on market conditions. “We are rushing to secure some prompt cargoes to cover our needs. Initial increase targets may be revised down to €175/ton though in line with the monomer settlement,” said a second buyer. Supply for South and West European origins are low due to some scheduled shutdowns during March and April, he highlighted. A distributor also believes that such hike targets may be moderated to €100/ton later this month if demand does not support them. In nearby Turkey, initial March offers for a West European producer surfaced with hikes of up to €190/ton too. “We did not expect such a huge increase in styrene contracts following the modest gain in benzene settlements for March,” a trader opined. March benzene contracts settled up with a modest gain of €19/ton in Europe. Although buyers hope sellers will adjust their hike amounts, spot feedstock costs continue to add to their gains in the region, according to ChemOrbis. 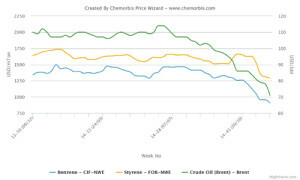 Spot benzene prices surged around $100/ton on CIF NWE just in a week. They also indicate a $90/ton increase in the last one month. 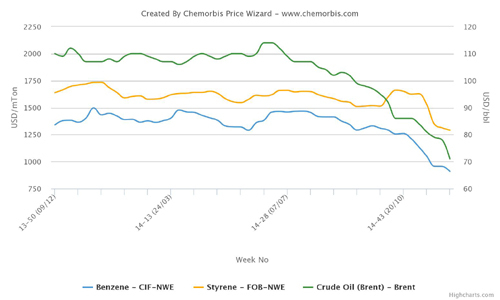 Spot styrene costs spiked $110/ton on FOB NWE basis on the week while the gain reached $210/ton in a month.